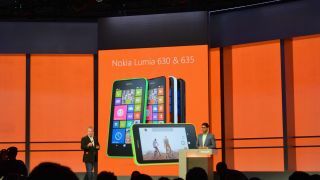 Microsoft and Nokia unveiled not one, but two new Lumia devices at the Build 2014 conference: the Nokia Lumia 630 and the Nokia Lumia 635. They're two budget-priced handsets that come in a variety of SIM configurations, Nokia Executive Vice President of Devices and Sevices Stephen Elop revealed. More importantly, they'll be the first two smartphones to launch with Windows Phone 8.1 - including the new Siri rival, Cortana - out of the box. The Lumia 630 and Lumia 635 bring "an un-compromised Microsoft experience and an un-compromised Lumia experience to more people at much lower price points," Elop said. The Lumia 630 comes in two variants: a standard single-SIM 3G version and a 3G dual-SIM model. It's the first Lumia phone to support two SIM cards, a feature enabled by the Windows Phone 8.1 update. The Lumia 635 is the 4G model, and it only supports one SIM. Elop demonstrated that it's easy to differentiate call histories, listings and more between the 630's two SIM cards, and switching SIMs on the fly when placing a call a matter of a single tap. Dual SIM phones will be important in the near future, Elop said, adding that analysts predict over 100 million will be sold in 2016. Both new Lumia phones come in five "stunning" colors, Elop said, and feature interchangeable shells. They're packing 4.5-inch LCD displays, 1830mAh batteries and 1.2GHz quad-core Snapdragon 400 processors. Additionally, the three-column interface new to WP 8.1 that Microsoft showed off earlier in the presentation works even on these smaller-screened devices, as demonstrated by Elop. Both phones will take full advantage of Microsoft's Siri rival, Cortana, as well. The Lumia 630 and Lumia 635 of course come with Nokia apps like Mix Radio and Here Maps, as well as Microsoft's new built-in fitness capability, called "SensorCore." With SensorCore, the 630 and 635 keep track of steps taken and calories burned using Bing Fitness and the phones' sensors. Both phones will launch in May starting in Asia and will travel around the world, arriving in the US by July. The 3G single SIM Lumia 630 will launch at around $159 (about £95, AU$170), the 3G dual SIM Lumia 630 will be $169 (about £101, AU$180), and the 4G Lumia 635 will sell for around $189 (about £115, AU$205). T-Mobile, MetroPCS , AT&T and Aio - an AT&T subsidiary - have all announced that they'll be carrying the Lumia 635 in the US. T-Mobile and MetroPCS will sell it for "a low upfront cost with zero service contract, zero overages, zero hidden device costs and zero upgrade wait." AT&T shared no further details except to confirm that the 635 will launch this year.